This artist's concept puts solar system distances in perspective. The scale bar is in astronomical units, with each set distance beyond 1 AU representing 10 times the previous distance. One AU is the distance from the sun to the Earth, which is about 93 million miles or 150 million kilometers. Neptune, the most distant planet from the sun, is about 30 AU. NASA's Voyager 1, humankind's most distant spacecraft, is around 125 AU. Scientists believe it entered interstellar space, or the space between stars, on Aug. 25, 2012. Image released Sept. 12, 2013. This time, researchers have used several clues about plasma changes around Voyager 1 to determine that it entered interstellar space around Aug. 25, 2012. NASA announced that Voyager 1 has arrived in interstellar space on Thursday (Sept. 12). One of the most convenient ways to determine the location of Voyager 1 is to measure the temperature, pressure and density of plasma, or ionized gas, around the spacecraft. Everything inside the solar bubble, or heliosphere, should be exposed to plasma that streams from the sun, whereas interstellar space is filled with denser plasma from the explosion of giant stars millions of years before. Unfortunately, the 36-year-old spacecraft's plasma detector broke in 1980. Compounding the problem was that interstellar space was completely uncharted territory. The simple models to predict how Voyager would behave as it left the heliosphere didn't match data coming from the spacecraft. "No one has been to interstellar space before, and it's like traveling with guidebooks that are incomplete," Stone said. The team expected to see a shift in the direction of the magnetic field at the boundary between interstellar space and the heliosphere. They also expected to see a sharp drop in the presence of charged particles from the sun and a rise in cosmic radiation from interstellar space. In May 2012, scientists detected a drop in charged particles and a jump in cosmic rays. Those changes accelerated around July 28, 2012, but the levels soon returned to normal. But by Aug. 25, all the particles originating inside the heliosphere dropped dramatically and cosmic ray levels skyrocketed — and the levels stayed that way. At first, this seemed to confirm that Voyager 1 had left the heliosphere, but the magnetic field direction had shifted only 2 degrees, a miniscule amount. This artist's concept shows the outer layers of our solar bubble, or heliosphere, and nearby interstellar space. NASA's Voyager 1 is currently exploring a region of interstellar space, which is the space between stars that still feels charged particle and magnetic field influences from the heliosphere. The magnetic field lines (yellow arcs) appear to lie in the same general direction as the magnetic field lines emanating from our sun. Image released Sept. 12, 2013. But in April 2013 scientists remembered that Voyager I had experienced bursts of radio waves in 1983 to 1984 and in 1992 to 1993 when interstellar plasma was bombarded with a huge blast of solar material. They expected to find similar oscillations once Voyager was jolted by interstellar plasma. On April 9, they noticed those oscillations, which likely occurred a year before due to a solar storm around St. Patrick's Day. The oscillations got bigger, indicating that Voyager was entering the much denser plasma of interstellar space. Most of the clues indicated that Voyager 1 was indeed surrounded by interstellar space. But charged particles were still bombarding Voyager preferentially from certain directions; in interstellar space, charged particles were supposed to come from all directions. Despite being bathed in interstellar medium, Voyager was still inside the sun's realm of influence. "In the end, there was general agreement that Voyager 1 was indeed outside in interstellar space," Stone said. "But that location comes with some disclaimers — we're in a mixed, transitional region of interstellar space. We don't know when we'll reach interstellar space free from the influence of our solar bubble." But while Voyager 1 is in interstellar space, there's a caveat that comes with its exit from the solar system, NASA officials added. "Informally, of course, "solar system" typically means the planetary neighborhood around our sun," they explained in a statement. "Because of this ambiguity, the Voyager team has lately favored talking about interstellar space, which is specifically the space between each star's realm of plasma influence." Technically, Earth's most distant spacecraft is still inside the solar system since it has 300 years till it reaches the inner edge of the vast Oort cloud where comets are born. 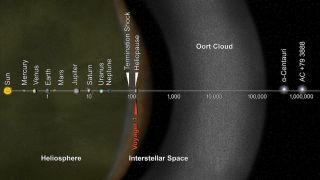 The journey through the Oort cloud could take another 30,000 years, NASA officials said. Follow Tia Ghose on Twitter and Google+. Follow us @Spacedotcom, Facebook and Google+. Original article on SPACE.com.